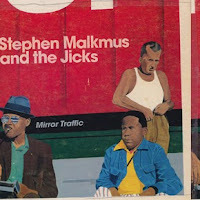 Whether with Pavement, as a solo artist or with his band The Jicks (their 2008 album, 'Real Emotional Trash' is outstanding), Stephen Malkmus has an amazing back catalogue of truly brilliant songs. There are few, if any, artists to match him. 'Senator' is the preview track from his fourth album with The Jicks, 'Mirror Traffic', due for release in August and produced by man of the moment, Beck Hansen. I don’t know how he feels about the relative lack of commercial success or recognition but, despite the hugely positive reception given to the recent Pavement reunion tour, he has every right to be confused. I wish I could say this time its all going to change, but 'Senator' is pretty much Stephen Malkmus on auto-pilot, with a slightly desperate lyric about senators and blow jobs. It's quite likely the album rises above this particular song, ‘cos the man is a mighty talent, and consistently capable of real genius. For now, 'Senator' hasn't lit the blue touchpaper. More details on the forthcoming 'Mirror Traffic' can be found at Domino Records.